Imagine waking up with intense, burning pain for no reason, or undergoing surgery only to find that the accompanying pain increases and spreads until it forces the use of a wheelchair. Worse still, imagine spending months—or even years—going to physicians who are unable to diagnose the condition. This is the grim reality for people with complex regional pain syndrome. The symptoms of complex regional pain syndrome can be very different from person to person. Once called reflex sympathetic dystrophy (RDS), complex regional pain syndrome (CRPS) is characterized by pain. According to the National Institute of Neurological Disorders and Stroke, “CRPS represents an abnormal response that magnifies the effects of the injury.” In other words, a small injury becomes a big pain. The pain associated with this syndrome may be constant and severe. It may begin in one small, localized area, such as a finger, and spread to include a much larger area, such as the entire arm. It may also spread to the opposite extremity. Painfully-increased sensitivity, called allodynia, may also occur, so that even a light touch on the affected area can cause severe pain. All of these symptoms are confined to the affected area of the body, so one leg might be swollen, blotchy, extremely painful, and difficult to move, while the opposite leg is completely fine. Sometimes, though, symptoms can spread, so both of an individual’s legs might be affected. Cases of complex regional pain syndrome are divided into two types, although some sources list a third type, as well. Type one (CRPS I) is characterized by severe, burning pain at the injury site, accompanied by muscle spasms, joint stiffness, and rapid hair and nail growth. Type two (CRPS II) is more intense pain, accompanied by swelling, slowed hair growth, unhealthy nail growth, and atrophied muscles. When differentiated, type three (CRPS III) is accompanied by unyielding, wider-spread pain, irreversible skin and bone changes, and severely limited mobility. There is no known cause for complex regional pain syndrome. 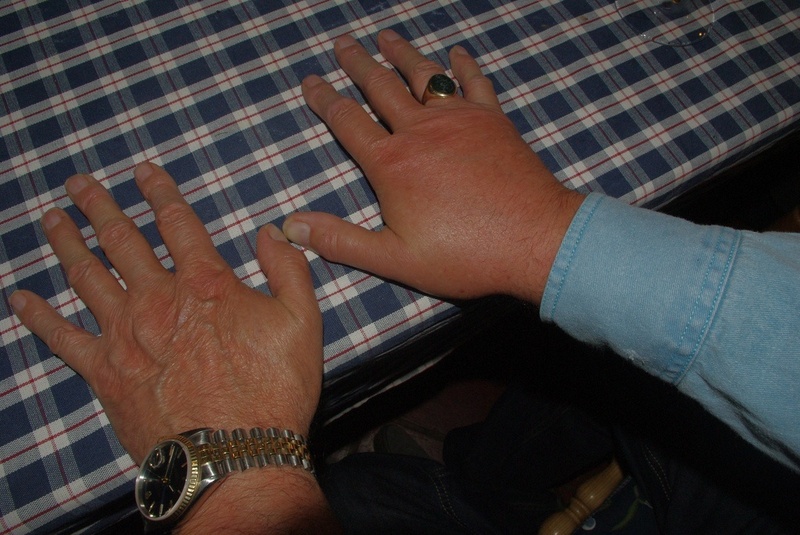 Some people develop complex regional pain syndrome at random, with no identifiable triggers. These people may simply wake up one day in agonizing, unrelenting pain. However, many people afflicted with complex regional pain syndrome develop it after an injury or surgery. Even something as simple as a soft tissue injury, like a cut or bruise, can trigger complex regional pain syndrome. In the case of photographer, blogger, and author Micaela Bensko, her complex regional pain syndrome developed as a result of a concussion and damage to her cervical spine after a tailgate hit her on the head. As pointed out here, the diagnosis of complex regional pain syndrome can be difficult. The symptoms can vary from person to person. There is often no clear-cut cause. In some cases, the condition can improve without treatment, which might end all attempts at diagnosis until the symptoms flare up again and make it necessary to start the diagnostic process all over. Additionally, there is no single test to confirm complex regional pain syndrome. A diagnosis relies on observation of symptoms and the combined results of several different diagnostic tests to rule out other conditions. A recent study brings researchers closer to understanding the cause of complex regional pain syndrome. The researchers from the University of Liverpool’s Institute of Translational Medicine, alongside researchers from the University of Pecs in Hungary, carried out a study on the autoantibodies in people with complex regional pain syndrome. Autoantibodies are naturally-produced but harmful antibodies that attack and damage bodily tissue. Usually, the body self-regulates autoantibodies, but sometimes—particularly in autoimmune disorders—the body fails to do this, allowing autoantibodies to multiply. If the cause of complex regional pain syndrome can be pinned down by more studies like this one, there may someday be a cure for it. For now, although there is no cure, there are several treatments that show promise at treating the symptoms of complex regional pain syndrome. Traditional treatments for complex regional pain syndrome symptoms include rehabilitation therapy, neural stimulation, or medication. Some alternative treatments, such as biofeedback, acupuncture, or chiropractic care, have also had some success. One newer treatment for complex regional pain syndrome symptoms is the use of hyperbaric oxygen (HBO) therapy. This involves the afflicted individual spending time in a pressurized, high-oxygen hyperbaric chamber. One study found that after regular HBO treatments, pain and swelling from complex regional pain syndrome were reduced, while the range of motion was increased. Another potential treatment for complex regional pain syndrome symptoms is the anesthetic drug ketamine. A study in Australia found that 76% of patients experienced full, although temporary, relief from pain after receiving regular infusions of ketamine. Eventually, this treatment was brought to the United States, where it has shown real success. A previous study at the University of Liverpool examined the effectiveness of intravenous immunoglobulin (IVIG). Patients in this study showed an average drop in pain of 1.55 on an 11-point pain scale. While this study wasn’t as thorough or as promising as others, it was noted that IVIG is significantly more cost-effective than some treatments, such as ketamine therapy. In Italy, researchers recently found that a bisphosphonate called neridronate can have very profound effects on type one complex regional pain syndrome symptoms. Bisphosphonates are typically used to treat bone-related conditions like osteoporosis. However, this study found that regular applications of the bisphosphonate neridronate caused significant reduction of pain and hypersensitivity when given intravenously. Have you known someone who suffered from complex regional pain syndrome?